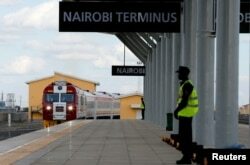 A gleaming new $3.2 billion railway cuts in half the travel time from Kenya’s capital, Nairobi, to the coast. Major investments in transportation, energy and maritime infrastructure are turning Pakistan into a major economic corridor. A new industrial zone in Thailand boasts solar, rubber and industrial manufacturing plants and is slated to host 500 companies by 2021. A train launched to operate on the Standard Gauge Railway line constructed by the China Road and Bridge Corporation and financed by Chinese government arrives at the Nairobi Terminus on the outskirts of Kenya's capital Nairobi, May 31, 2017. All are parts of China’s ambitious Belt and Road Initiative, featuring billions of dollars in infrastructure investment across Asia, Africa and the Pacific. The global impact is forcing the administration of U.S. President Donald Trump to rethink elements of its plan to cut back on foreign assistance under an “America First” strategy. U.S. Secretary of State Mike Pompeo, interviewed Friday in Mexico City by VOA contributor Greta van Susteren, said Chinese foreign investment will not overwhelm the U.S.
"We don't have any problem with Chinese commercial investment. That's their right to go compete in the world," he said. "I'm convinced that if we compete with them all over the world we'll do incredibly well." When “very senior people” in the administration traveled abroad and “saw that China was eating our lunch, they thought to themselves, 'We have to do something,' ” said Daniel Runde, an analyst with the Center for Strategic and International Studies (CSIS) in Washington. And in a number of quiet moves affecting private investment, humanitarian aid and women’s empowerment abroad, the administration and the U.S. Congress have been doing just that. In what is being seen as a major policy reversal, Trump this month signed the so-called BUILD Act, described by the nonpartisan CSIS as "the most important piece of U.S. soft power legislation in more than a decade." The new law merges and boosts agencies and programs that had once been targeted for deep budget cuts, creating a new entity tasked with providing loans, political-risk insurance and equity stakes to U.S. firms investing in developing countries, from Afghanistan to Zambia. The agency will be known as the U.S. International Development Finance Corp., or USIDFC, and have a $60 billion budget. It will absorb the existing Overseas Private Investment Corp. (OPIC) and more than double that agency’s current budget of $29 billion. The USIDFC is “a much-needed instrument of commercial diplomacy that the U.S. has been sorely lacking,” said Witney Schneidman, a former deputy assistant secretary of state for African affairs, in a recent blog post for the Brookings Institution. In a follow-up phone interview, Schneidman said he thought the new agency would help "get U.S. companies interested in Africa on its own merit. ... It does put the U.S. on level with the Chinese” by matching Beijing’s policy of making equity investments in companies seeking to do business overseas. FILE - A map illustrating China's silk road economic belt and the 21st century maritime silk road, or the so-called "One Belt, One Road" megaproject, is displayed at the Asian Financial Forum in Hong Kong, Jan. 18, 2016. Even at $60 billion, the new U.S. program will be dwarfed by Chinese investments in Asia and Africa. But Brookings analyst George Ingram said its impact can be magnified by partnering with other international lending organizations. The BUILD Act has its critics, especially among free-market conservatives who believe the government should not get involved in private business decisions. "The idea of equity participation was kind of sold politically that it was going to be the U.S. responding to China’s One Belt, One Road [initiative] and yet there was no mention of China in the legislation at all,” James M. Roberts, an editor for the Washington-based Heritage Foundation’s annual “Index of Economic Freedom,” told VOA in an interview. By ensuring equity stakes, “that means the government is going to be a shareholder in foreign companies,” added Roberts, who has listed a potential for “cronyism and misallocation of capital” among his concerns. 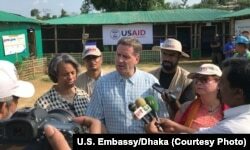 FILE - USAID Administrator Mark Green, center, speaks to reporters at the Balukhali Rohingya refugee camp in Cox’s Bazar, Bangladesh, May 15, 2018. He says a new measure promoting U.S. prviate investment in developing countries will aid their economies and 'advance foreign policy interests.'. Interviewed last week for VOA’s “Plugged In With Greta Van Susteren,” Green, a former Republican congressman who later served as ambassador to Tanzania, said there’s a “fundamental difference” between U.S. and Chinese approaches to development abroad. China favors loans that can include “unsustainable financing that mortgages a country’s future,” he said. In contrast, USAID expects recipients to implement reforms. “We ask them to respect certain rights and values. What we want for them is to become eventual trading partners, but equal partners,” Green added. The Trump administration has demonstrated a renewed openness to international aid in other ways as well, including a recent five-year extension to an anti-hunger measure known as the Global Food Security Act. It supports USAID programs such as the Feed the Future initiative, which partners with governments, NGOs, private enterprise and others "to strengthen agricultural markets and then entire food systems," said Beth Dunford, who oversees the initiative. It calls for supporting women’s property and inheritance rights and ending gender-based violence. It also requires that USAID integrate efforts to empower women in all of its programs, and it broadens support for women-run small- and medium-size businesses. The bill, which enjoys bipartisan backing, is being promoted by first daughter Ivanka Trump. She tweeted her thanks this week to four U.S. senators for advancing the bill. “Women’s economic empowerment doesn’t always get a lot of attention in Congress, so this bill is something we’re quite excited about,” said Nicole Ellis, who manages policy communications for the international relief agency CARE. Gayatri Patel, CARE's senior policy advocate, said the agency is working closely with legislators, noting they want "practical recommendations and approaches." That might include endorsing approaches such as the CARE Village Savings and Loan Association program that CARE started in Niger in 1991. The goal, she said, is to encourage aid that has "a catalytic effect on women, their families and their communities." Patsy Widakuswara is VOA's Senior White House Correspondent. She joined Voice of America in March 2003. With over 20 years experience in international broadcast journalism, she currently reports via multi-media platforms from the White House where she focuses on delivering informative, engaging U.S. content to an international audience.